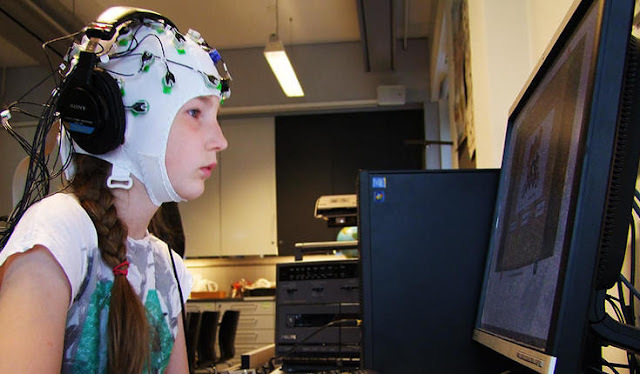 Mismatch negativity can be obtained using EEG and used to study the effects of a learning game, for example. The electric brain response, mismatch negativity, was discovered at the University of Helsinki 40 years ago. Now, it is one of the brain’s most investigated mechanisms. “We can think about the brain as an organ that is constantly predicting the future. If the predictions are correct, everything is fine, but an incorrect prediction triggers processes in the brain. Those error signals are absolutely crucial in how we function: how we learn new information, and update our memory”, says brain researcher, Professor Laurel Trainor from McMaster University in Toronto. Deviations from the brain's predictions can be observed with the mismatch negativity (MMN) response, which can be obtained with electroencephalogram, EEG. It is visible as a rise in the electroencephalogram before we are even aware of the change. By inspecting this deviation, we can study how the brain models outside stimuli. Trainor, along with 200 other brain researchers, took part in a conference dedicated to research conducted with mismatch negativity at the University of Helsinki in the middle of June. She conducts studies of infants’ brains and was one of the first in the world to start utilizing mismatch negativity in research on brain development at the beginning of the 1990s. It is now known that mismatch negativity is visible in the brain already at the foetal stage. In addition, it can be observed in the brains of animals, people who are asleep, and even coma patients. 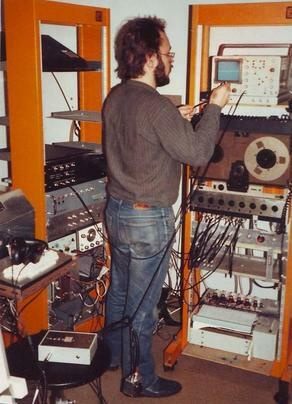 OLD LABORATORY EQUIPMENT TO MEASURE MMN FROM EEG. CONTEMPORARY DEVICES ARE PORTABLE. Since then, mismatch negativity has been studied using nearly all methods of brain research, but EEG is still the most common. It is measured with electrodes placed along the scalp. 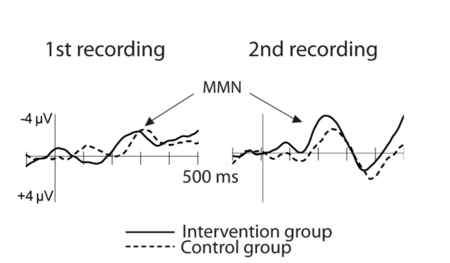 Mismatch negativity is visible most strongly at the auditory cortex, and most experiments are concerning the auditory sense. The current directors the Cognitive Brain Research Unit at the University of Helsinki, Professor Teija Kujala and research director Mari Tervaniemi both started their research careers in Näätänen’s laboratory at the beginning of the 1990s. Kujala has utilized mismatch negativity while studying dyslexia, for example. An ongoing longitudinal study is monitoring the development of 150 children at risk of dyslexia in comparison to controls. The children have been investigated longitudinally since birth. “Through mismatch negativity, we have observed that those in the risk group have less-mature brain responses, which indicates underdevelopment in the auditory cortex. In addition, the brains of these children process sounds differently from those of the controls”, Kujala states. Some of the children are being rehabilitated through music, and mismatch negativity is being utilized to see whether supporting the neural development of sound processing at an early phase can promote literacy later on. Tervaniemi has studied musicality and musicianship through the viewpoint of mismatch negativity. She has made multiple observations on the ways musicians’ brains process the different properties of sound. At the beginning of her career, she investigated with the mismatch negativity how natural sounds are processed in the brain. It soon became clear that natural sounds elicit greater responses than artificial sounds. “The more natural the sound, the greater the response, despite them being more for the brain to ‘digest’“, states Tervaniemi. She is currently supervising a thesis on how mismatch negativity is used to observe how activities at a musical playschool affect the linguistic development of pre-schoolers. Tervaniemi emphasises that brain-related factors revealed through mismatch negativity correspond with the performance of test subjects. However, it cannot yet be used as a diagnostic method. Mismatch negativity has been studied for 40 years in hundreds of research groups. There are nearly 5,000 academic publications on the subject. Currently, studies are being conducted in approximately 70 countries throughout the world. The massive amount of information has caused some to wonder whether the method could be used to study individuals in addition to groups. “Some have suggested using it as an indicator of musicality or literacy, but the results gained thus far have all come from groups”, Tervaniemi says. This means that conclusions regarding an individual’s skills or characteristics cannot be based on mismatch negativity. “The subject requires further development before it can be used at an individual level”, Kujala says. Both researchers emphasise that mismatch negativity is a good example of how longitudinal basic studies are required before developing applications. “Without Risto Näätänen’s basic research, we would not know as much about dyslexia, the development of infant brains or the recovery of coma patients as we do now. It took us 40 years to speak of these applications”, says Tervaniemi. Mismatch negativity is one of the brain’s evoked responses. The advantage of the response when comparing to others is that its nature is understood quite well, as a result of extensive research. Researchers are interested in solving how mismatch negativity is connected to the brain's other activities. “One of the directions we are going to is how mismatch negativity fits in with other brain responses, and what it represents in the bigger picture of the whole brain. Is it confined only to sensory areas, or are there also mismatch processes all over the brain?” Laurel Trainor wonders. Recent studies have already inspected the different processes of the brain’s frontal lobe and sensory areas. Knowledge of how everything is connected and how it affects our functions will increase substantially. Mismatch negativity is an electric brain response which takes place approximately 150–250 milliseconds after an irregular stimulus. Mismatch negativity already exists in the foetus in the womb and can be observed in animals, as well. The reaction is automatic, meaning that it is possible to study babies or special groups that cannot express sensory observations. “It can be used to study discrimination accuracy, like how well we can differentiate between different sounds. It is also useful for researching memory functions and learning, because the response changes as we learn new things”, says Professor Teija Kujala. Mismatch negativity has been used to study, for example, people suffering from dyslexia, aphasia, autism, memory loss or unusual brain damage, children using cochlear implants, people with schizophrenia, and coma patients. “This method can be used to study people of any age, regardless of their condition”, Kujala specifies. In its simplest form, the test repeats two different kinds of stimuli, like two syllables, for example, where one is repeated often and the other irregularly, in a trial design that measures the test person's electroencephalogram and observes changes in it. The tests often use auditory stimuli, but other forms of sensory stimuli have been used as well. Mismatch negativity was discovered by Professor Risto Näätänen at the University of Helsinki (b. 1939). His book, co-written with his research colleagues, will be published soon (publisher: Oxford University Press).